Erik L. Strandness explains Christian apologetics for readers from all walks of life. I want the readers to feel comfortable with their faith so they can be bold advocates for the Gospel. 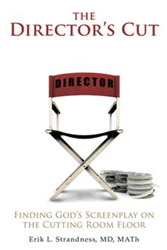 Author Erik L. Strandness arms Christian readers with accessible language to defend their faith and explain it to others in his new book, “The Director’s Cut: Finding God’s Screenplay on the Cutting Room Floor” (published by WestBow Press). Written for lay Christians, “The Director’s Cut” employs a “bottom up” approach to apologetics by examining the life experiences common to all people and concluding that they can only be explained by the Christian worldview. To better illustrate his thoughts, Strandness likens God’s creation to a theatrical production where the set represents earth’s infrastructure, the props represent animals, the characters are the humans, the plot conflict is sin, and the resolution is found on the cross. He offers a detailed evaluation of the ability of the most prominent worldviews to explain each of these theatrical categories and concludes that the only credible account is found in Scripture. Strandness, who practiced neonatal medicine for 20 years, often felt himself at odds with his faith, unable to express his beliefs in the same language he used to express his scientific views. He felt compelled to share the insights he had obtained on his journey in order to help others feel comfortable with their Christian faith. Dr. Erik Strandness practiced neonatal medicine for 20 years. In 2009, he went back to school and obtained a master’s degree in theology. He currently teaches science, religion and history at a classical Christian school in Spokane, Washington. He is married with three children. WestBow Press is a strategic self-publishing alliance between HarperCollins Christian Publishing and Author Solutions, LLC — the world leader supported self- publishing. Titles published through WestBow Press are evaluated for sales potential and considered for publication through Thomas Nelson and Zondervan. For more information, visit westbowpress.com or call (866)-928-1240. For WestBow Press news, click “Like” at facebook.com/WestBowPress and follow @westbowpress on Twitter.